It can be challenging for a parent or guardian to help their child understand and cope with the loss of a loved one, particularly a sibling. There are many books that deal with children’s issues when coping with the death of a family member. 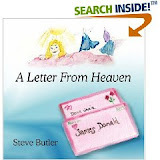 In his children’s story, A Letter From Heaven, author Steve Butler addresses a rarely talked about issue regarding the questions and feelings children have when they discover that their parents had a previous child who died. Jamie is a young boy full of curiosity and questions. His inquisitiveness about a ceramic jar sitting on a shelf causes him to constantly question his mother about it. For a long time, his mother was quick to give a simple answer that satisfied him. As time passes, he becomes even more curious. His mother finally sits him down and retrieves a letter from the jar. She reads the letter and Jamie discovers that it is written to him from his sister who died shortly after being born. A Letter From Heaven is a poignant and heartfelt story that explains what happened to Jamie’s sister before he was born. Within the letter, such themes as family, love, peace, life after death, and the connection with nature in terms of birth, death, and rebirth, are raised. The story is beautifully crafted to help children understand and cope with death. It is very positive and written with great care, emphasizing the grieving process that includes acceptance. With beautiful illustrations enhancing the story, A Letter From Heaven, is a very tender and uplifting story. It is highly recommended as an aid for parents, therapists, and educators, to help children through the grieving process when discovering the unexpected loss of a baby through either a miscarriage, still born, or sudden infant death. The book is a must have for every library.